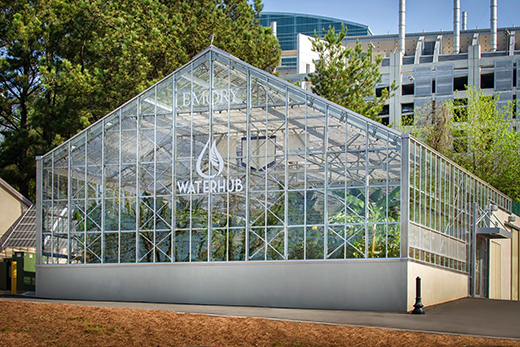 Emory University, in collaboration with Sustainable Water, is lessening its water footprint with a new facility called the WaterHub. It's a water reclamation facility that recycles and treats sewer water to heat and cool Emory's buildings. Accolades continue to accrue for the WaterHub at Emory. The first-of-its-kind water processing facility has won its sixth honor since its official opening in April of this year. The latest is the 2015 Innovative Deal of the Year Award, presented to the WaterHub by the Water Urban Land Institute Virginia, an organization dedicated to providing leadership in the responsible use of land and in creating and sustaining thriving communities worldwide. The award was given for the WaterHub's advanced land use and design practices that respect the uniqueness of both the built and natural environments. "The judges were beyond thrilled with the project and came up to us after to learn more," says Natalie Zvanya, business development coordinator at Sustainable Water, a partner with Emory in creating the WaterHub's reclamation and reuse system. The WaterHub is an on-site water recycling system on the Emory campus utilizing eco-engineering processes to clean wastewater for future non-potable uses. It is the first such system to be installed in the United States. The WaterHub has the capability to clean and recycle up to 400,000 gallons of wastewater per day, displacing nearly 40 percent of Emory's total campus water needs and making a significant impact in the water-stressed Atlanta region. Matthew Early, Emory's vice president for Campus Services, calls the WaterHub "a fantastic facility that has made a tremendous impact on how we think about water and how it is utilized." "Since the WaterHub has been in operation, it has made me wonder why using reclaimed water for utility make-up water is not the national norm, since there is no reason to use water with the quality that meets the standard for drinking water," he says. "Emory is showing others that using reclaimed water for utility make-up water is a best practice." Early adds that there have been close to 100 visits to the WaterHub since January 2015, showing interest in the technology as well as the use of the reclaimed water. Ciannat Howett, Emory's director of sustainability initiatives, praised the impact of the WaterHub. "Matthew Early, his staff and Emory's administration should be applauded for shifting Emory's heating and cooling to recycled wastewater, thereby relieving our overburdened sewer system and reducing our demand for drinking water for these purposes," she says. "The WaterHub at Emory is a great example of Emory's national leadership in sustainability by employing innovative technology to address the global need for water conservation and sustainable sanitation solutions," Howett notes. The 2015 Innovative Project of the Year from the WateReuse Association, the first of its kind ever awarded by this association, recognized the WaterHub as "a unique, innovative project that is practical and implementable to enhance the sustainability and efficiency of reclaimed water." In September, the Metro Atlanta Chamber of Commerce presented Emory and contractor Reeves Young with first prize for the WaterHub in the "Liquid Assets" category of the chamber's E3 awards. Also that month, the Chattahoochee Riverkeeper honored Emory with the River Sustainability Award for leadership in sustainability including success in reducing energy and water demands. The 2015 Project Achievement Award was presented to the WaterHub by the Construction Management Association of America in its "Infrastructure Private Sector" category. The award recognizes the project's success and outstanding achievement in the practice of construction management. The American Council of Engineering Companies of North Carolina presented its 2015 Engineering Excellence Grand Award to the WaterHub based on its unique and innovative applications, future value, perception by the public, complexity, and fulfillment of the client's requirements. The WaterHub at Emory was also the only U.S. finalist in the International Green Gown Awards competition this November.